Meeting has been postponed due to weather. A new date will be announced soon. If the weather cooperates, Phase One of the development of Radebaugh Neighborhood Park, the grading and seeding, should be completed in March. 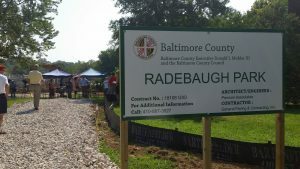 A team of folks from the Green Towson Alliance did a tremendous job working with Baltimore County to assure that the Park will start with a functional and attractive foundation on which to build. As we enter Phase Two, a new team, the Friends of Radebaugh Neighborhood Park, is forming to help give input as to the kinds of amenities (like trees, pathways, play spaces and benches) the neighboring communities would like to see in the park. Going forward, this group will also take on tasks that will be needed to maintain a safe, clean, and actively used park. If you think you might be interested in being a part of this group, or if you would just like to hear an update on the progress of the park, please come out on the 11th with your questions and ideas.